I went to the State Arboretum of Virginia this morning to spend an hour on the walking trail. I’d planned to take my camera and photograph the birds while I practiced for the Virginia Working Landscapes survey season, but at the last-minute I decided to just take my binoculars so I could really concentrate on bird IDs. I saw and heard a variety of birds, and with my Audubon Bird App on my iPhone I was able to ID a few unfamiliar ones just through their calls. I had great views of some flashy birds, too, including Baltimore Orioles, a White-Eyed Vireo, an Eastern Towhee, several Indigo Buntings and my favorite, the Pileated Woodpecker. After the walk, I spent some time in the garden with my camera since the wildflowers are so beautiful. 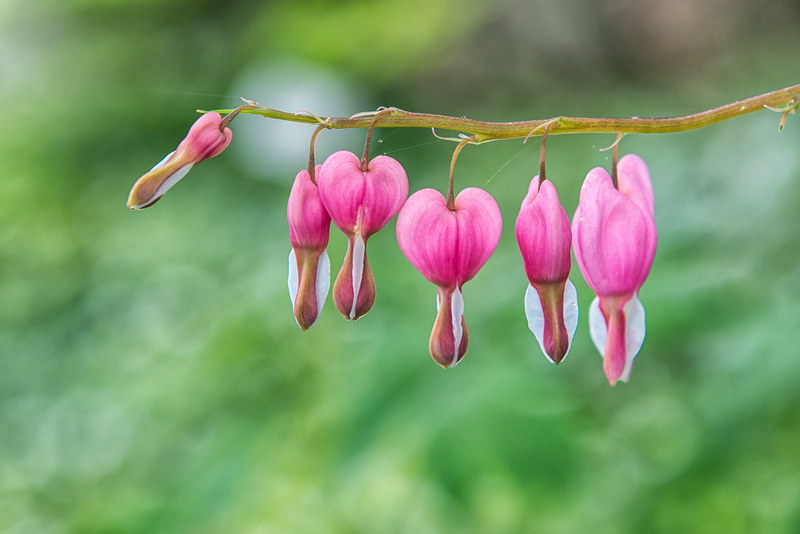 This photograph of the Bleeding Hearts, in full bloom, seemed to work well for this week’s Photography Challenge, too. The Garden Fair is this weekend, so the grounds look especially colorful now. I believe I will return this weekend to do some shopping. With more than 80 vendors expected, it could be a fun way to spend the Mother’s Day morning and find some fun additions for the yard and the birds! Bleeding hearts are gorgeous at this time of the year. Yes they are! It was nice to spend some time with them this spring. This is gorgeous. So crisp, great DOF, the soft pink. Beautiful! This was a lucky shot. Didn’t have a macro lens so just played around with settings. Good thing the subject was patient!